Philando Castile, a 32-year-old black man who was shot and killed by a St. Anthony police officer during a traffic stop in July, had been pulled over and cited almost 50 times in his 14 years as a driver. The revelation put pressure on St. Anthony police to analyze their practices, and the department released five years' worth of its traffic citation records. The data was stark: It showed vast racial disparities among drivers cited by St. Anthony Police Department. It shows black drivers were cited at a rate more than three times the population of the surrounding counties. But the picture it painted was incomplete — the data doesn't show demographics of everyone stopped, just those who were ticketed — and it's nearly impossible to compare to data from other departments across the state. Even the St. Anthony Police Department acknowledged the inherent limitations of the data it released. How often are black drivers in Minnesota pulled over, when compared with white drivers? There's no way to know. That's because Minnesota doesn't require police departments to collect traffic-stop data, so agencies don't record information about who they stop and who they cite in any uniform way. That means there aren't comprehensive, statewide records of racial, ethnic or gender breakdowns among who's getting pulled over, who's let off with a warning and who's issued a citation. • Have you had experiences with traffic stops that you'd like to tell us about? Here's how you can share. It's a problem shared by police leaders across the state. Inconsistent data gathering tools, and the discretion officers have to decide whether to note race and gender, make it difficult to widely examine racial disparities in traffic stops. Experts say it's more important than ever to collect and analyze traffic data in a consistent manner, especially after encounters with police turn deadly. 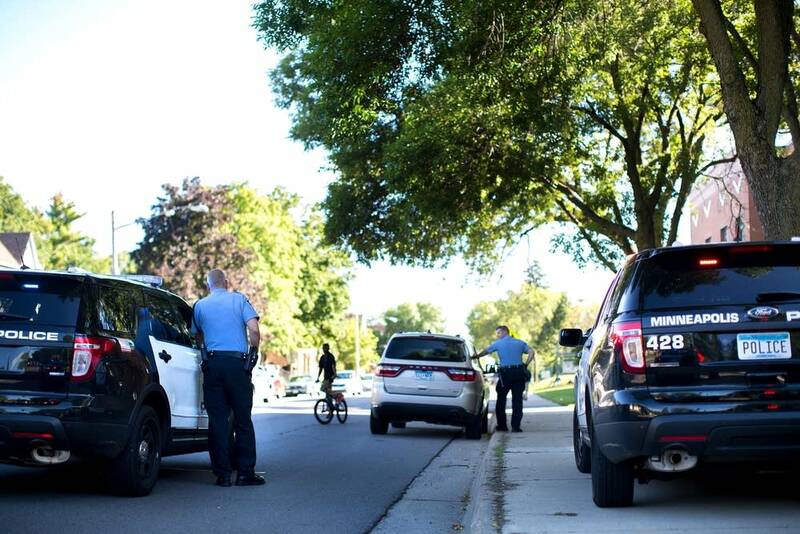 Some Minnesota police departments, including Minneapolis, St. Anthony and Maplewood, have recently started recording demographic information about everyone they pull over. Others have decided to participate in national studies, like the one underway at The Center for Policing Equity. The Los Angeles-based research organization is building a database of traffic-stop records with the help of police departments across the nation. The Center hopes to analyze the nationwide data, then report back to local departments about how they compare, pointing out red flags, bias or flaws in policy and procedure. Chris Burbank, who is leading the study, is also the Center for Policing Equity's director of law enforcement engagement. His work focuses on studying the daily interactions between law enforcement and the public: Traffic stops, community events, arrests and all that's in between. Most of those end positively. But when they don't, as in the case of Philando Castile's interaction with St. Anthony officer Jeronimo Yanez, Burbank said it comes down to a fundamental question of purpose in policing. "You saw a very negative outcome in Minnesota. If we don't want that to happen, we need to ask ourselves, 'Why are we doing what we're doing?'" Burbank said. "What was the purpose of that engagement, and what level of safety and protection was that providing to the community?" One Minnesota police department participating in the study is the first-ring suburb of Maplewood. Chief Paul Schnell said he's hoping to get a better sense of how his department compares with others. In early October, Schnell began requiring all of his police officers to report race data to the Ramsey County dispatch center. It's a protocol the St. Paul Police Department has been using since 2001. The dispatch center would then keep all data on race and gender, and whether the person was searched at the traffic stop. Ramsey County then makes the data available to each police department to retrieve and analyze. "It does become a way for us to have a higher level of accountability to know what's going on," Schnell said. "We anticipate that some of the data is going to show some disparities, and so we need to be able to make meaning of that as we go forward." The Brooklyn Park Police Department is hoping to launch a partnership with Hennepin County early next year that would mirror Maplewood's work with Ramsey County. They intend to record information from all traffic stops, whether they resulted in a citation or not. Chief Craig Enevoldsen said he wants make data collection as seamless as possible by airing it over the radio the same way police officers air the license plate number and violation. A quarter of Brooklyn Park's population is black, and the northwest suburb is home to a large portion of the Twin Cities' Liberian immigrant population. "When I go to different community meetings, I'm confronted with data that I don't know where it comes from," Enevoldsen said. "Frequently I'll be told, you're X times more likely to be stopped in Brooklyn Park than this city based upon demographics. I have no idea where that data comes from because I don't capture that right now." The Castile shooting hit close to home for some police chiefs in the Twin Cities, prompting them to rethink their traffic stop practices. In Maplewood, Chief Schnell said it's nearly impossible to know whether bias played a role in the Castile shooting. "We never can know the heart or mind of that cop who's stopping that car." But when he thought about the nearly 50 times Castile had been cited, he wondered. "Why was the plate run so many times? That's probably what prompted the stop." Schnell said that flag itself can become the basis for the stop. So can a cracked taillight, headlight or a non-working license plate light. An expired tab is another reason an officer might stop and ticket someone. Each of those stops often lead police to find additional violations, like lack of insurance. State public defenders represented a total of 27,965 cases last year in which drivers were charged for violations such as no insurance, driving without a valid license or DWI. Seventy-eight percent of those charges were issued for driving without insurance or a valid license. Those violations typically show up during license plate checks. In Minnesota, a driver's license will be suspended the first time a driver fails to appear in court or pay a fine. State public defender Bill Ward calls those small offenses "crimes of poverty." "If you're a person with minimal means, do you choose to feed your kids or choose to pay the government to get your license back that you feel shouldn't have been taken away from you in the first place?" Ward said. And then the familiar story: The person doesn't pay the fine, has his license revoked, continues to drive, gets stopped by police in a routine or random stop, and is fined again. The cycle continues. Philando Castile had racked up $6,000 in driving-related fines and fees — and he wasn't alone. Thousands of drivers around the state get stuck in an endless cycle of court fines and fees. Ward said he's constantly confronted with anecdotes from clients who say race plays a significant role in their encounters with police. But without consistent data practices across police departments, testing that assumption has been a challenge. Next year, Ward's office, the Minnesota Board of Public Defense, plans to launch a case management system that will help the organization gather demographic information about its clients, in the hopes of better understanding exactly who is being stopped by police. "If the data is true that a person of color is 50 percent, 60 percent, 70 percent more likely to be pulled over, to be stopped and frisked, I believe we should be challenging those pre-textual [stops] as being race-related and unconstitutional," Ward said. "But it's impossible to do do that unless you have the data."